The report in three parts herewith is an edited, expanded version of one that Salisbury wrote and sent recently to US State Department senior officials and other US inter-agency officials who cover Venezuela. Click here for About the Author. While Venezuela’s Nicolas Maduro is on much shakier ground following new rounds of massive street protests and marches of hundreds of thousands of Venezuelans against his delegitimized and increasingly internationally unrecognized de facto regime after Venezuela’s 2018 presidential elections were widely denounced as being rigged and a sham in light of major opposition candidates being barred or boycotting and complaints of voting irregularities–and while Venezuela’s National Assembly President Juan Guaido invoked a Constitutional article to assume a “transitional presidency” of the country and has been recognized by the United States, the United Kingdom, Brazil, Colombia and a growing number of countries and whose transitional government appears to be gathering more support–recent events in Venezuela are so far no guarantee that Maduro, who is digging in, will step aside or be forced out. Thus, from the standpoint of those supporting the anti-Maduro coalition, one should not be complacent, and it is not the time to sing victory–lots of hard work remains. Notes Jorge Bustamante, the former head of Colombia’s national agency of statistics DANE: If the momentum of recent events isn’t sustained, there could be a risk of a bell curve-like peaking and then a decline in efforts aimed at Maduro’s departure–as happened in previous years where there were massive marches and spikes in opposition resistance to Maduro only to mostly fizzle out for the time being. A big difference this time is the United States’ and other countries’ recognition of Guaido’s transitional government, a new so far well-coordinated campaign of international diplomacy–interacting with the Guaido government–ratcheted up economic and other sanctions with real teeth, a (at least for now) subsiding of internal bickering among Venezuela’s opposition to Maduro, and the anti-Maduro movement’s rallying around Guaido. On Which Side Does Time Favor? On which side does time favor? It could be argued that it could be a mixed bag. Every day that Guaido is not arrested, killed or otherwise harmed and his transitional government survives, that seems to point to the greater the chances of the Guaido government gaining its sea-legs, consolidating and extending its reach, to the detriment of Maduro becoming increasingly marginalized even to degrees of irrelevancy–with perhaps an increasing chance of a fracturing in the Venezuelan Armed Forces, which are the main buoy keeping Maduro afloat, and in other Madurista/Chavista structures. However, the longer Maduro stays in place, his bet could be on Guaido and the opposition losing steam; on the opposition falling back into its traditional internal bickering; on a supposed eventual loss of interest among the international community; on more time for his allies–including Russia, China, Iran and Turkey–to come more comprehensively to his aid, although they have relatively limited options on Venezuela; and on a possibility of dashing or dissipating high hopes among the anti-Maduro masses that Maduro and his cronies would be gone. Scenarios of a “messy end” for Maduro (or for Guaido on the flip side if Maduro troops attack him) and for the Venezuelan people in general–who are already suffering a humanitarian disaster and suppression of democratic rights, civil liberties, and human rights–cannot be discarded. 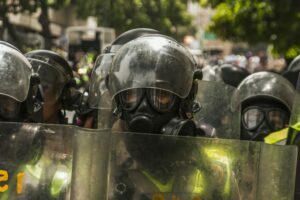 While civil war in Venezuela seems to be a remote possibility at this moment–and something that should be strenuously tried to be avoided–it or some sort of armed clashes cannot be ruled out in the future. And while an international military invasion like that of Iraq would not seem to be the way to go in Venezuela–and which could be counterproductive and have prolonged negative consequences, even if it got Maduro out–forms of international humanitarian intervention/action, perhaps with a military component (such in the facets of support, logistics, and protection) could be seen to have an eventual determining constructive role. International Humanitarian Intervention/Action, a “Blueprint” Being Implemented? While it may not correspond to US officials to get publicly into details of strategies at this moment, I wrote a “blueprint”/outline on a hypothetical international humanitarian intervention/action option regarding Venezuela in September 2018 which I sent to US State Department senior officials and other US and British inter-agency officials or contacts, and it appears that some observations of my “blueprint”/outline have been or are in the process of being implemented, whether by coincidence or not. One that has not been yet implemented, but which could very well be on the drawing boards, is that there could be the creation of humanitarian enclaves/”safe havens” (or “bolsones” in Spanish) inside Venezuelan territory deemed suitable and propitious, most likely including border areas. The Guaido transitional government–being recognized by the United States, the United Kingdom and dozens of countries–would first have to make an invitation to the international community to establish such zones. If Maduro balks at and threatens it, the US-participating international coalition could consider using a military component to establish, support and protect the zones. Why consider the option of humanitarian enclaves/safe havens inside Venezuela? Some reasons that could be argued for it would include: 1) It would relieve the catastrophe of the mass exodus of Venezuelan refugees which is overburdening and threatening to overwhelm and destabilize Venezuela’s neighbors. 2) It would be an even further element pressuring Maduro and his coterie not to stand in the way of a return of civil liberties and free and fair elections. If Maduro continues to dig in, the mounting pressure could lead to Venezuelans even in Maduro’s own inner circles to (further?) discuss seriously his exit from the scene. 3) It would avoid a bloodbath of a traditional-style invasion like in Iraq, which is not necessarily in the cards nor necessarily under consideration. Of course, we don’t want to see violence. In such a scenario, given Latin American sensitivities to a history of US military intervention in the region over the past century, Latin American countries could provide the on-the-ground personnel–including a possible military peace-keeping, support, logistical component in the humanitarian enclaves/safe havens. And countries like the United States, regional powers, the United Kingdom, or others would play leading or important roles one way or another, in close coordination and consultation with the Guaido transitional government. Given that Colombia, Brazil and Guyana share borders with Venezuela, they may not want to risk souring relations with a significant segment of Venezuela’s population (even if it is a relatively small fraction) for years by sending in their military troops; and thus, they may prefer to keep their participation just to humanitarian, diplomatic, economic, logistical or other support functions to the anti-Maduro movement (if an international military humanitarian force were to possibly go into Venezuela). What if the Maduro forces were to militarily attack the humanitarian enclaves/safe havens? While Maduro might cite a viewpoint of defending Venezuela’s sovereignty if he did so, it could look very bad for him–as his blocking the entry of international humanitarian aid into Venezuela has reaped condemnation against him–and raise an international clamor, which might be a factor for him to decide not to order an attack on such enclaves. But if Maduro ordered an attack on humanitarian enclaves/safe havens, the international coalition supporting the Guaido transitional government would have the sufficient capability to protect against it, and it could perhaps mean a forceful response in kind by the international community–within the parameters of international law and presumably with the endorsement of an international body such as the Lima Group or Organization of American States–which could result in a swift end of the Maduro regime. 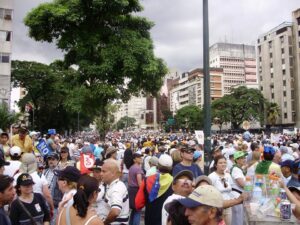 Further possible options toward consolidating Guaido’s transitional government; safeguarding and delivering international humanitarian aid in concert with Interim President Guaido’s government to Venezuela’s population suffering atrocious levels of hunger and desperate poverty under Maduro; and eventually carrying out free, fair and transparent presidential and other elections with international verification include, but are not limited to, the following–by Venezuelans themselves inside Venezuela, and outside Venezuela by the international community and others… Click the following link to view Part 2.